VecTor analysis software, originally developed at the University of Toronto, are a set of nonlinear finite element analysis programs for reinforced concrete structures subjected to static and dynamic loading conditions. While primarily intended for reinforced concrete, a number of other material types including SFRC, masonry, wood, prestressing steel, FRP, SMA, MMFX can be considered with the built-in material models. The programs use a smeared, rotating-crack formulation based on two well-recognized theoretical models: the Modified Compression Field Theory and the Disturbed Stress Field Model. For more information about the programs visit the VecTor Analysis Group. At Carleton, our research team is working closely with the VecTor Analysis Group to further develop the programs, enhance their capabilities, and extend them to advanced research areas. 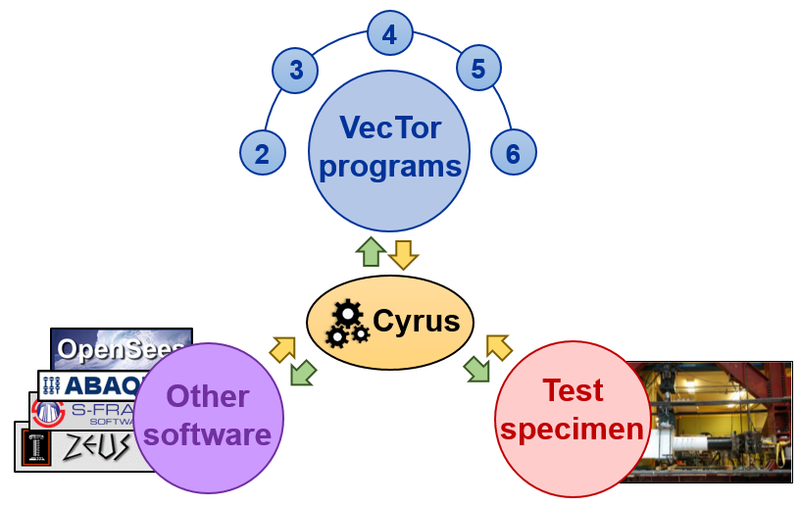 Cyrus, developed by Dr. Sadeghian along with F.J. Vecchio and O-S. Kwon, is a multi-platform simulation framework which enables to combine a wide range of analysis software (including VecTor programs) with each other. It also allows integration of analytical models with physical specimens to conduct hybrid (numerical-experimental) testing. The simulation framework fully satisfies the compatibility and equilibrium conditions between different substructures. Recently, Cyrus is enhanced with a standardized data exchange format (UTNP), developed at the University of Toronto, which facilitates addition of new analysis tools to the framework. For more information about Cyrus please contact Dr. Sadeghian.